"Harlem 1958" , also known as "A Great Day in Harlem," is a black-and-white photograph of 57 jazz musicians who gathered at 17 East 126th Street -- a brownstone here in northeast Harlem between Fifth & Madison. Freelance photographer Art Kane took the photo on August 12, 1958, and it was then published in the January 1959 issue of Esquire. “I came up with the idea of getting as many musicians together in one place as we could," Kane later said of the shoot. "It would be sort of a graduation photo or class picture of all the jazz musicians. After I thought about it some more, I decided they should get together in Harlem. After all, that’s where jazz started when it came to New York." Many of the musicians -- who included Dizzy Gillespie, Thelonious Monk, Benny Golson and Count Basie -- met up under the N.Y. Central (now Metro-North) Railroad at 125th Street, and the station was soon overrun with jazz musicians before they started to move west along 126th Street. "One by one, these extraordinary people showed up," Kane remembered. "Next thing you know, I was standing there, watching them all move into that street. The thing is, I couldn't control it, because you had musicians who hadn't seen each other in one solid congregation probably ever before." Help us commemorate the 60th anniversary of the historic photograph by co-naming the block on East 126th between Fifth & Madison “Art Kane: Harlem 1958 Place." More details to come! Easily recognized by his puffed-out cheeks and unusual angular trumpet, Dizzie Gillespie was one of the key figures in the birth of the brash, speedy, lopsided jazz known as "bebop." Nicknamed "Dizzy" because of his comical antics, Gillespie played a trumpet with the bell angled upward at 45 degrees, a quirk which became his signature. The title of one of his band’s most famous tunes -- “The Kid from Red Bank” -- is a tip-off that William “Count” Basie was born in Red Bank, N.J. Many associate him with Kansas City, however, since that's where his music really took off. 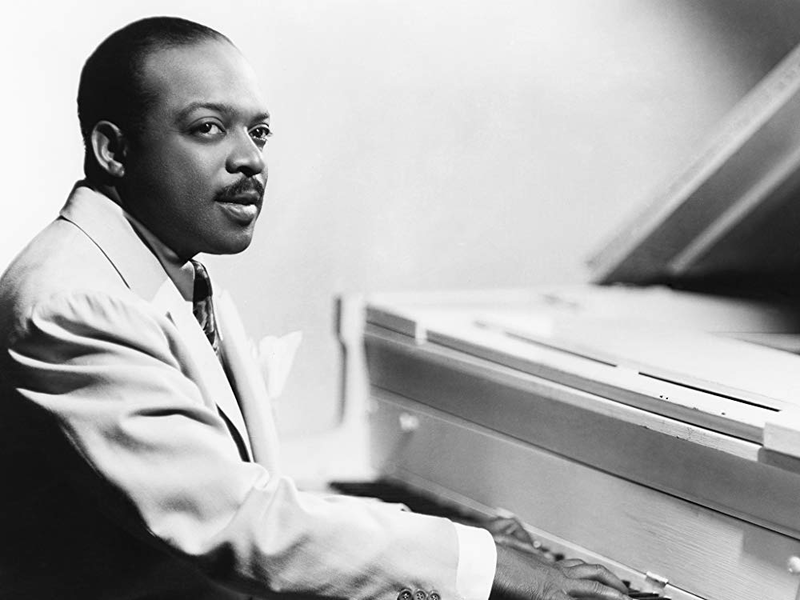 Known for innovations such as the use of two "split" tenor saxophones and the contrapuntal accents of his own piano, Basie got the name "Count" from a radio announcer who compared him to the other jazz royalty of the time, Earl Hines and Duke Ellington. Basie took his orchestra to New York in 1937, and they made the Woodside Hotel in Harlem their base (142nd Street & Adam Clayton Powell Boulevard). Thelonious Monk was born in Rocky Mount, N.C., then moved to New York City at the age of 4. He began studying classical piano when he was 11, and by the age of 13, had won the weekly amateur contest at the Apollo Theater so many times that the management banned him from re-entering. In 1941, Monk joined the house band at Minton's Playhouse, where he helped develop the school of jazz known as bebop. Alongside Charlie Parker and Dizzy Gillespie, he explored the fast, angular and often improvised styles that would later become synonymous with modern jazz. Charles Mingus grew up in the Watts neighborhood of Los Angeles. By the 1940s, he played bass professionally with famous bandleaders Louis Armstrong. In 1951, he settled in New York, where he worked as a sideman, recording and performing with other jazz legends such as Charlie Parker, Bud Powell and Miles Davis. After a few years, he formed an experimental musicians' group called the Jazz Workshop. As a soloist, Mingus was known for his rich and diverse combination of influences, including gospel, New Orleans jazz, Mexican folk music and modern classical. Lester Young was a tenor saxophonist and occasional clarinetist who came to fame as a member of Count Basie's orchestra. Born in Mississippi and raised in New Orleans, he left the South at age 18 after refusing to tour in clubs where Jim Crow was in effect. In New York, he became close to Billie Holiday, giving her the name "Lady Day," while she nicknamed him the “Prez.” Known for his creative use of language, Young coined some of the most famous jazz jargon -- including "bread" and “cool.” He played with a relaxed, cool tone and used sophisticated harmonies, using what one critic called "a free-floating style." Young was the first musician from the Harlem 1958 photo to pass away, after which several fellow musicians wrote tribute songs, including Charles Mingus' "Goodbye Porkpie Hat" and Wayne Shorter's "Lester Left Town." Art Blakey, also called Abdullah Ibn Buhaina (or "Bu"), was a drummer and bandleader often called the “father of hard bop,” an offshoot of bebop. With a style that featured thunderous press rolls and cross beats, his drum solos often began as quiet tremblings and grew into frenzied explosions. Born in Pittsburgh, Pa., Blakey taught himself to play piano (and later drums), then played in jazz clubs in the evenings while working in the steel mills by day. Starting in his twenties, he began to play with other noted performers including Billy Eckstine and Sarah Vaughn. In 1948, he visited Africa, learned polyrhythmic drumming and was introduced to Islam. In 1954, he founded the Jazz Messengers, a band that over the next 35 years featured an unending supply of talented sidemen, many of whom went on to become band leaders in their own right. Some have counted more than 200 Jazz Messengers alumni, including Benny Golson, Terence Blanchard and Wynton Marsalis. Coleman Randolph Hawkins, nicknamed "Hawk" and sometimes "Bean," was one of the first jazz artists to become known for playing saxophone. Historically, the trumpet, trombone, clarinet, bass and piano were much more prominent in jazz, with tenor saxes usually played only in short bursts on the beat. However, Hawkins had a keen ear for new styles and changed this, covering both traditional jazz standards and departing into what one critic called "the early tremors of bebop." Born in Missouri and schooled in Kansas, Hawkins settled in New York City in the early 1920s in the days of the Harlem Renaissance, where he played with Mamie Smith's Jazz Hounds and in Fletcher Henderson's Orchestra with Louis Armstrong. For much of the 1930s, he toured in Europe, and in the early 1940s became a leader on some of the earliest known bebop sessions.